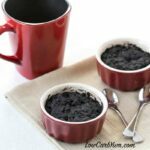 The best low carb chocolate cake recipe ever! Shredded zucchini makes it moist and is well hidden. The kids will never know you are sneaking in a vegetable. 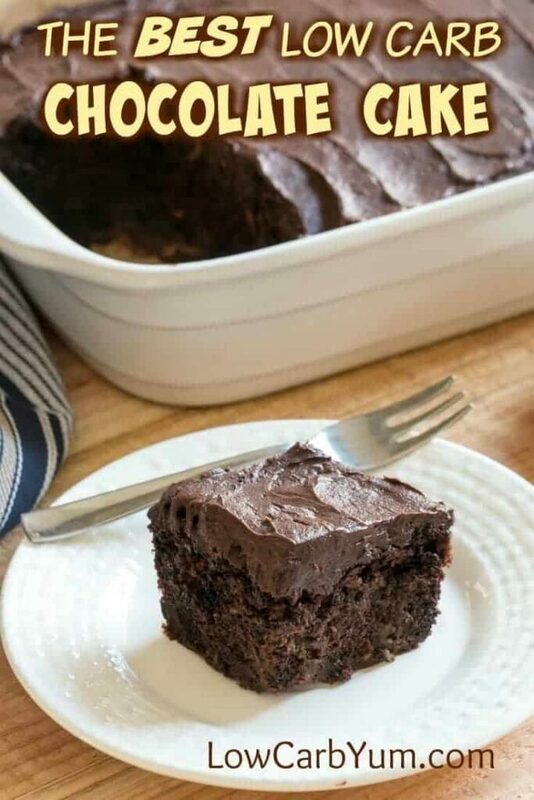 I’d like to share my favorite low carb chocolate cake recipe with you. It’s been a hidden gem on this blog for over five years now. 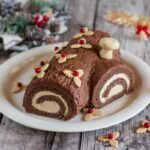 Looking for other low carb cake recipes? Check out my recipe index for other low carb dessert recipes! The reason it’s been hidden is that it’s labeled as a German Chocolate Zucchini Cake. 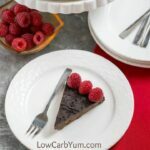 However, if you read the comments on that recipe, you’ll discover why it’s the best low carb chocolate cake recipe around! I decided to repost the original recipe for a standard cake size. This recipe will produce two 9-inch rounds, a 9×13-inch sheet, or about 24 cupcakes. That’s the same as a regular box cake mix. When my sister-in-law asked me to make a gluten free cake for my niece’s graduation party at the beginning of the summer, I knew exactly which recipe to use. All who tried the cake could not believe it was low carb and gluten free. Why not give it a try? Find out for yourself why this has become the best low carb chocolate cake recipe for my family and friends! I am confident that it will soon be your favorite low carb cake recipe too. You’ll also love that this is a super simple cake to make. 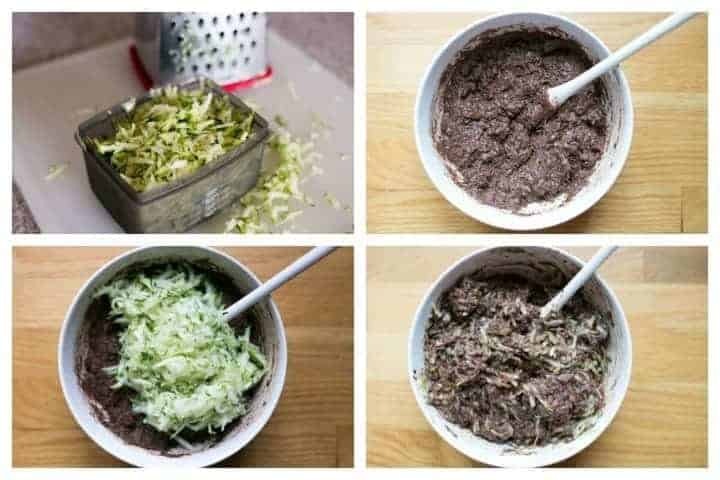 I typically use a box grater to shred the zucchini, but you could save time by shredding it in a food processor. It takes about one large or two small zucchini to get 4 cups shredded. No need to be exact. And, you don’t have to drain it much as you want the cake to be moist. If you want the cake to be extra chocolatey, go ahead and add the optional chocolate chips. You can use homemade chocolate, cut up a low carb chocolate bar, or use sugar free chip like Lily’s. 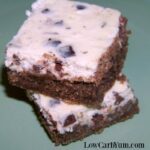 This low carb cake recipe is great with or without the additional chocolate chips. I topped off the cake with a low carb chocolate buttercream frosting. For a celebration cake, I’d recommend using a traditional vanilla sugar free buttercream like this one for decorating. I’ve made this low carb chocolate cake at least once a year since I first discovered in the summer of 2011. Each time, it has always came out perfect. It’s a yummy way to use up those summer zucchini in the garden. So far, I’ve baked this cake three times this year alone. Our garden is producing a lot of zucchini right now so I may be making some chocolate cupcakes this weekend using this recipe. If you are still searching for the best low carb cake recipe, you need to give this one a try. I don’t think you’ll be disappointed. It has always been a hit when shared with my family and friends. You may want to cut the recipe in half if you aren’t sharing it with others. It makes a good sized cake. But, it also freezes well if you can’t eat it all at once. From my experience, the addition of zucchini really makes the difference when it comes to low carb cakes. It’s the secret ingredient in this moist chocolate cake. And, if you shred it up with a fine grater, no will will ever know you hid in a healthy vegetable. 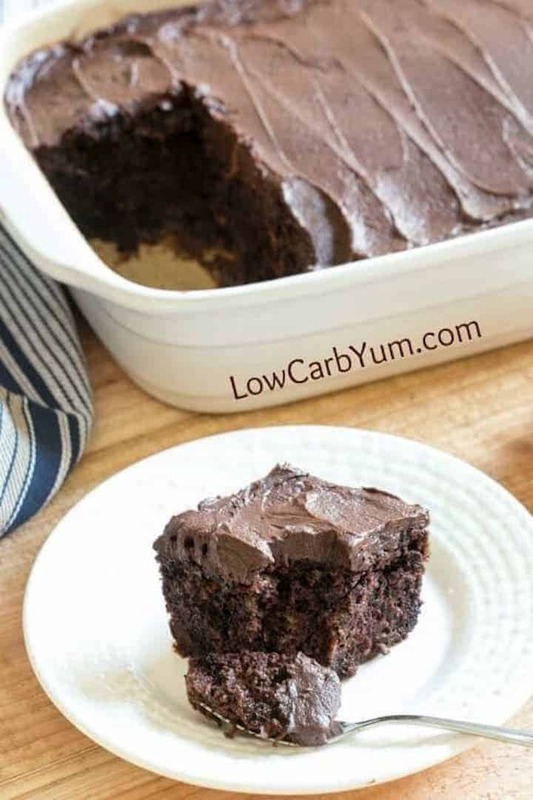 Enjoy this super moist low carb chocolate cake! It’s the most requested cake from those in my family who avoid sugar and gluten. Let me know what you think of it in the comments below. In large mixing bowl, combine coconut flour, cocoa, Sukrin+, monk fruit, cinnamon, baking soda, baking powder, and sea salt. Mix in eggs, coconut oil, and vanilla until well combined. Stir in zucchini (and optional chocolate chips if using). Spread out into greased 9x13-inch pan (or two round 9-inch pans). Bake at 350°F for about 30-40 minutes or until toothpick inserted in center comes out clean. NOTE: smaller pans, such as 9-inch round pans should be checked around the 15 minute mark. Cool on wire rack. Once cool, frost with chocolate buttercream frosting if desired. 2-4 tablespoons of any 1:1 sugar equivalent low carb sweetener can be used in place of the concentrated stevia powder. I just made this cake after trying another Keto recipe using almond flour that turned out grainy. I halved the recipe because I only had 2 cups of zucchini and used Splenda and Hershey’s Special Dark cocoa. I also threw in some dark chocolate candy bar chunks. First the appearance was very dark (ok for dark chocolate lovers) and the cake was appropriately spongy. It was incredibly moist and you would never know it was loaded with zucchini. I used too much cocoa and not enough Splenda, but with a few tweaks this will be an incredibly good chocolate cake! You could try. But for the sweetness you’d need at least 2 cups which may cause crystallization (a common problem if using too much erythritol). I tried it tonight and it salad perfect. I replaced the sweeteners with agave and it was fine. Does the zucchini have to be wrung out with a towel, to get out the excess water? No. You want the moisture from the zucchini in the cake. How many total servings are you considering when looking at the nutritional information? Also – do you freeze the cake with the frosting already layered on the cake. Currently in my oven and for whatever it’s worth, it SMELLS great so far! The number of servings is at the top of the recipe card. For this recipe, it’s 24 so I keep the servings pretty small. And I do freeze the cake with the frosting. This cake was awful. Attempted a layer cake, would not come out of pans, way too dry, crumbly. Don’t waste your time or eggs on this one. 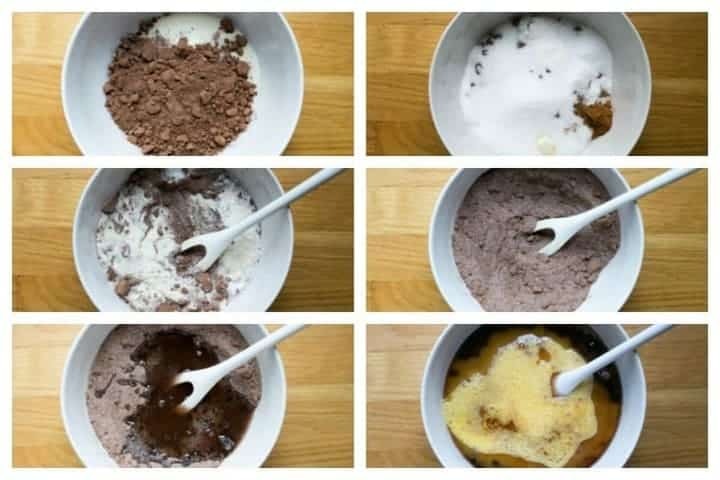 It sounds like you over baked the cake and didn’t grease or use parchment lined bottom pans (or silicone) for easy release which is what’s recommended when baking low carb cakes. Truly the best! I made it without adding any more sweetener (omitted Stevia) and it was perfectly sweet enough. Texture was like a light brownie. Used Cool Whip and fresh raspberries that were frozen from the season’s pickings last year. What a great, low carb dessert! Great way to top it off with whipped cream and strawberries! I used to use a monk fruit extract (concentrated liquid form) but I now use a monk fruit blend bulk sweetener. So I did change that to stevia as there’s already monk fruit in the sweetener I use. 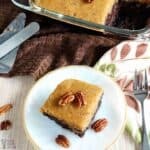 This is one of the best Keto desserts I have made. I cut the recipe in half, yet made the full amount of frosting. It made 12 wonderful cupcake. I just made this. They rose like a cupcake, looked like a cupcake, were moist like a cupcake and were VERY coconutty. I made cupcakes, will freeze and eat till gone. But remake IDK – they have texture of fine coconut and taste a lot like coconut. Not for everyone. It’s worth a try but I haven’t tested it. But it should work out okay. Erythritol based sweeteners do have a cooling taste to them. However, I’ve found adding a little cream cheese seems to lesson that. You can use a fiber based sweetener instead if you want, but I’ve found those to cause digestive gas. Could you use gluten free flower to replace the coconut flour , if you don’t like the taste of coconut? You’d have to make other changes in the recipe as it’s not a one for one sub. Almond flour would be a good substitute as well. It’s worth a try. Or you could try to grate the zucchini in smaller shreds. Wow. This is the most real dessert I’ve had on keto. I used Swerve granular in the cake and Swerve powdered in the icing and the little amounts of monk fruit and stevia in the recipe. It tastes wonderful and has a great texture. My non keto family liked it too although maybe not as much as I do. I’m glad you and your family enjoyed the cake! What texture does this have? Can you use almond flour instead? It’s got a spongey texture and you’d have to change other ingredients to use almond flour. Could i use almond flour instead of the coconut flour? This is a coconut flour recipe so other changes are needed. To use only almond flour, you’d need more of it along with less liquid and or eggs. This is the ultimate low darb chocolate cake!!! I used erythritol and extra stevia glycerite for the sweetness of a box cake and this is amazing. Even after a week in the fridge this is still moist. My brother who refuses to even taste anything “diet” liked this. Am making it again today. YUM! Thanks for the tip on the stevia glycerite. I find it does tend to give a nice boost of sweetness. I am not a big chocolate person, but I loved this cake. It is very moist. I used swerve and monkfruit sugar. How do we go about doing it as a yellow cake? I’ve just returned to make this again and wanted to leave a note to say how much we liked it. First time I made 1/3 recipe for a 4×8 casserole and this time I’m taking it camping and will half it for an 8×8 metal cake pan. Thanks for this recipe – it truly is the “best”! Great idea to bring along camping for a little treat. Hope you had fun during the trip! So our cake turned out terrible (it looked great), but we think it was because we couldn’t find any of the other sweeteners (monk fruit for the cake, stevia glycerite and Swerve for the frosting) and instead used the equivalent amount of Stevia per the recipe notes. The flavor for us was honestly 0-1 star but I feel like it’s mostly because of the Stevia, I haven’t tried the other sweeteners mentioned so I’m not sure if they have the same bitter aftertaste but I would assume not based on other comments. The cake itself was very moist and we actually couldn’t see the zucchini at all, which surprised us! I ate a bite of the cake with no frosting, and we didn’t like it but the taste wasn’t awful, it didn’t really have much flavor (but it did have the Stevia aftertaste), but the frosting just did not taste good to us. It’s definitely the sweetener. I find it best to combine sweeteners for the best overall taste. And some like the cake a little sweetener than others. I’ve made the cake with a low carb buttercream for a birthday cake and even those not following low carb enjoyed it. To any one who never tried it…….You have to try SWERVE. use equal amounts as substitute for sugar. No aftertast, no gas problems etc. amazon sells the powdered and granulated versions. I haven’t yet made this cake but will soon. If you think it was your sweetener, why give a low star rating? I use Stevia and have found I need to use about half the amount of it compared to other sweeteners. This cake is loved by our young twin daughters and myself; even my hubby who is not a “low-carber” or a chocolate cake lover has enjoyed this cake many times. I’m so glad it’s a low carb cake your whole family enjoys! I made this cake today, since our zucchini went wild while we were away for a week. I was worried about the odd “cool” sensation I seem to get from the Swerve, so at first I just added 1 cup of the sweetener, but I changed my mind and put in the full amount after all. I used 1/8 tsp of a liquid Stevia as well, so maybe this is what helped it to work out. I filled an 8″ x 8″ cake pan, and had enough batter left for six heart-shaped donuts (came out like miniature bundt cakes) and another six “muffin tops.” This is now my all-time favorite healthy cake! I can’t even imagine eating a store-bought cake or something that came from a cake mix now. This surpasses any cake I’ve ever had. My husband liked it and said he would never have known it used no wheat flour, used a sweetener other than sugar, and had zucchini in it. He declared this a recipe worthy of taking on our sailboat when we entertain guests for dinner. And yes, for anyone wondering, this is absolutely Birthday Cake-worthy! Thanks so much for sharing your experience with the cake recipe Gracie! I love that you made a few mini cakes too. I just made this in the 9″ pans. I don’t know what I did wrong, but I had a terrible time getting out of the pans, so it is pretty much crumbled and it will be hard to frost.., but it is still DELICIOUS! So I highly recommend the rectangular 9 x 13 long pan. Thank you for this delicious treat! You can line the bottoms of the pans with parchment paper to make them easier to release. 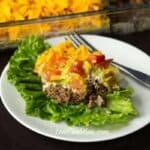 My family and I eat a low processed carbohydrate and sugar diet and this recipe sounded great. The trouble with that is finding alternative’s for my sweet tooth. Although my cake turned out different from what your pictures display I’m quite happy. My result was closer to a sponge cake. I use Pyure as a sweetener and I processed the zucchini into a mush. I was afraid my kids would catch a glimpse of zucchini and be done with it. I plan to perfect future attempts. You could peel the zucchini so the kids don’t see any green if you want to leave it grated. I found this recipe through Virta Health’s blog. So glad I did. It is absolutely fabulous. I made cupcakes – because that helps with portion control – though I have to admit I ate two warm out of the oven, unfrosted. I am freezing half a dozen to take on an upcoming camping trip. Do you have to store the cake with frosting in the fridge? I always do, but it should be fine left out for a couple days. This cake looks amazing ! I wanted to make this for my son’s birthday but he’s allergic to eggs. I know some people use bananas would that work with this recipe? I’ve had good results using gelatin and water whipped up with the granular sweetener to a white fluffy consistency as an egg replacer in baked goods. Hello. I am trying to make this cake for my little brother as he is a diabetic. I couldn’t find monk fruit powder anywhere. They were all sold out at the places that I looked. I did find Swerve (confectioners powder not granular) and 100% natural Erythritol granular sugar. Will those work? HI, this cake looks amazing. I want to make it for my birthday in two weeks. I cannot use any artificial sweeteners as I cannot tolerate them and strictly use monkfruit powder. Should I leave out the 1:1 sweetener entirely? Use more monkfruit? Or do you think this recipe won’t work without the extra sweetener? All monk fruit should work but you may need to up the liquid without the granular. Made the cake yesterday and I am quite surprised at how good it was! I used 100% Erythritol and Swerve confectioners in-replace of the monk fruit. I only put 3 cups of zucchini instead of 4 as the zucchini I had shredded was really watery and I was nervous that the 4th cup would’ve over did it. I grated the zucchini on the smallest part of the grater. I did add Hershey’s sugar free chocolate chips, couldn’t find Lilys. The only thing that I would leave out or maybe put less, is the cinnamon. The cake had a cinnamon aftertaste, which was meh for me as I don’t like cinnamon. The cake was so moist and everyone loved it! My little brother who’s a diabetic and who has never eaten cake before said “is this what it’s like to be normal”. For the frosting I used sugar free cool whip and sugar free chocolate pudding with a cup of milk. Thank you for this recipe, it was great!! Thanks for sharing your experience with the recipe Amanda! It’s great that your brother was able to finally enjoy some cake. Thank you so much for this recipe!!! I am pregnant and have gestational diabetes but I have been craving chocolate cake! This has completely hit the spot! 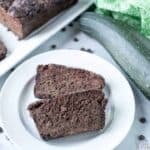 The cake is moist and has just the right flavor without the nasty aftertaste that most of the low carb desserts have. I did use the swerve sweetener (almost the whole bag, 1 1/2 cups plus 2 tablespoons) and omitted the monk fruit powder. I peeled and blended the zucchini into small pieces and found it did not effect the texture too much. If you didn’t know it was there you wouldn’t have been able to tell. I also added the Lily chocolate chips which was a good addition. I was worried that it would have a coconut flavor but it did not. I personally topped mine with a little bit of whipped cream which was perfect instead of making the frosting. I highly recommend trying this recipe! Thanks again!!! Adding the chocolate chips definitely provides the best taste. What is the net carbs for a piece of this cake, 9×13, and 9×9? Many people who made this cake complained of flavor once baked … bitter, etc. Will liquid Stevia counteract the cooling effect of Erythritol? How much coffee/espresso powder should you add? If you make this in cupcakes, how long should you bake them? Net carbs is roughly 2.5g per square (9×13 cut into 24 small squares). To offset the taste of erythritol, I like to use a stevia/erythritol blend along with monk fruit. You don’t need much espresso powder. Maybe a teaspoon or so. For cupcakes, I’d say about 15 minutes or so, but would check around the 10 minute mark. Made this cake tonight with the german chocolate cake icing. Moist and good. 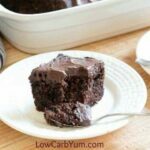 Definitely the best low carb chocolate cake recipe I’ve tried. Thank you! BEST Low Carb Cake i ever had! Thanks for this Killer Recipe. Wow! Cake came out delicious. I used Erythritol sweetener for the whole recipe. Made half a cake to make sure it wasn’t a disaster, should have made the whole cake. Thank you. Awesome! I’m so glad it worked out for you. I made this with high hopes, for my mom’s birthday. I followed the recipe to a T. It turned out disgusting as a dessert. It tasted more like zucchini bread with an icky artificial sweetener and baking cocoa after taste. I do not recommend this recipe at all. I spent so much on it and was so disappointed. It could have been the ingredients you used as they do vary widely. I made this cake for my mom (who follows a keto diet), and she LOVED it! My sister, her boyfriend, his family, and my mom’s coworkers (some who are not dieting) all loved it as well. Thank you so much for the recipe! Thanks for letting us know how well this cake worked out for you Amanda! Made the cake the other day! I used two small zucchini and the cake was dense and a bit on the dry side! The icing was great though! Made this cake this weekend and the texture is very grainy, what causes this? This cake should not be grainy at all. None of the ingredients listed should make the texture that way unless too much is used. They should both work. Just make sure to convert the sweetener as needed. So I’ve made this cake twice now and both times they were Amazing! The 1st time I made it I did use the zucchini but I thought it was a little weird so the 2nd time I replaced the zucchini with 3 cups of heavy cream and it was spectacular! If anybody else finds the zucchini flavor a bit off putting I would definitely recommend this substitute. Interesting! I wouldn’t have thought to use heavy cream. I’ll give it a try. Quick question for you, Lisa – in the recipe (and the link), the sugar looks granulated, but the video shows powdered/confectioner’s style for the larger quantity amount. Can you confirm for me? I’ve got granulated and powdered Swerve on hand at the moment. Out of my granulated monk fruit. I use granulated in the cake, but powdered will work too. However, only powdered should be used in the frosting. Great recipe. A real cake with real cake texture for keto wow. Really happy with the quantity this makes and it was easy to follow. Thank you for giving us a satisfactory solution to our cake cravings. Hi just made your cake today. I so loved it. Changes on sugar because I can’t fins monk fruit here on the Philippines. My son loves it also. Thanks for sharing this recipe. This was amazing. I made it as cupcakes as a Friday treat for my 6 kids, ages 1-9 (who have not been huge fans of every recipe I have tried since starting LCHF/Keto) The oldest two thanked me for making a “normal” treat and requested it for upcoming birthdays! AMAZING! I did half coconut flour and half oat fiber but everything else was the same. I will shred the zucchini finer next time, but honestly it was SO GOOD! 100! Thank you so much for this recipe! I Made it yesterday and didn’t have any problems with the cake sticking .My problem is that there is something that has an after taste but a lot I’m not sure if it is the coco power or the stevia, but it’s very strong. I don’t know exactly what it is. It could be either the cocoa or stevia. Sometimes I add a little instant coffee to enhance the flavor. I find baking with any stevia always gets bitter. I avoid it and only use Swerve. Do you peel the zucchini before you grate it? I don’t peel the zucchini before grating. But, if you want to hide it, you may want to peel it so the green pieces don’t show. yay!!!! finally a “sweet” recipe that actually tastes good and is not grainy like almond flour. This was a huge success. We are fairly new to keto but I’m getting the hang of the “new” way of baking. My go to sweetener is Sola. I used it in this recipe – a little less than what was called for in the recipe. My cake was moist and did not stick in the pan. Previous experience with adding zucchini – such as in zucchini bread- is you have to seriously grease the pan. I took this to a pot luck and no one new it was a “healthy” cake. Thank you for this awesome recipe!!! Hi could I sub in almond flour for coconut? And if so how much? It won’t work one-for-one in this recipe. WAH! I don’t know what went wrong. I had such high hopes! The batter tasted good but it turned out ew. I can’t explain what is wrong with the flavor. My husband doesn’t like it either. He also liked the batter. The consistency is perfect though. We aren’t a fan either. Seriously, probably the best chocolate low-carb cake I’ve ever made. Had the kids and grandkids over and they loved it (even the grands!) I will be making for my high school so nice to kids tomorrow they’ll never know the difference. I used to make this cake with a regular recipe and loved it. I now tried this recipe and frankly, it was awful. First, the frosting tasted great but needed four times the liquid listed. I followed the cake recipe exactly and it never blended correctly. It was like a bunch of pebbles with zucchini when it went in the pan. The zucchini never baked in, it was apparent it was there. Also, the cake was bitter, grainy and awful tasting. My husband was so excited to try it but after one bite pushd it away. I do not know what was wrong as I followed everything to the letter. I have no idea what you did, but I’ve made this cake over a dozen times now without issue. Maybe your measurements or ingredients were off? What kind of cocoa were you using? Was it by chance the raw kind? And, finely grated zucchini should not be seen. What kind of grater did you use? i would love to try this, this weekend. i have unsweetened raw coco (cacao?) powder. 1 cup seems like a bit much and would be more bitter. if its unsweetened do i half the amount? my hubby does not like super dark chocolate taste he finds it to bitter. I do believe that the raw cacao needs less, but I used regular unsweetened cocoa in the tested version. I made this last night and I had Hershey’s Special Dark 100% cocoa powder (100% cacao) on hand. I used that to the suggested measurement and it had a very strong bite in the aftertaste I thought it was a lot of powder too). Almost to the point of a burning sensation. I also used Swerve granular in the cake and confectionary for the frosting. The texture of the cake and the flavor was perfect minus that extreme aftertaste. Do you think that was the swerve or the dark cocoa powder? I want to make this again but get it right as I think it has real potential. What cocoa powder do you use? Sorry I’m new to this whole natural baking and low carb gig, lol. It could be a little of both, but likely more the cocoa. Some people also prefer the cake a little sweeter so for that I like to add in a little more monk fruit sweetener. I have been low carbing since January 1, 2012. I have tried many chocolate cake recipes since then, and I believe that this is the best so far! Thank you so much for sharing! Hi, is it possible to substitute almond flour for coconut flour? Thanks! Not in this recipe. Sorry! It’s designed to use only coconut flour. tried this cake today and it tastes amazing! the zuchinni makes it soft (although i should prob grate it a bit smaller – my partner said it was a bit weird to see green in his cake, nonetheless he ate a whole slice). the flavor is good, we didnt have monk fruit but replaced with with sweetener. I just made this recipe for the second time this month and WOW! It is amazing! My kids and husband (who are not low-carbers) love it too. I made it to recipe but omitted the monkfruit both times as I don’t have it on-hand. I used Sweve as my only sweetener and added one cups of Lily’s Baking Chips. 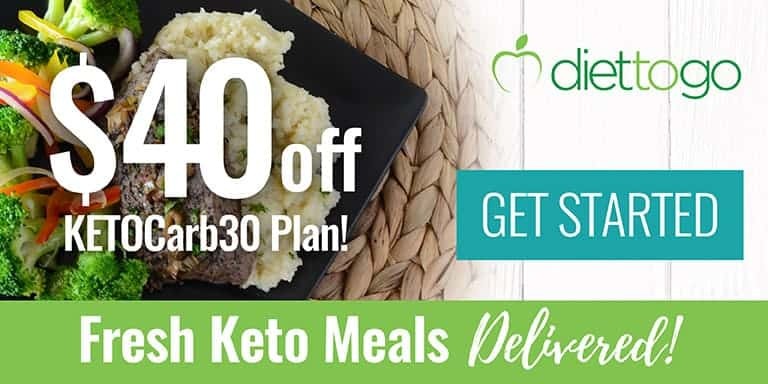 Thank you, thank you and I can’t wait to try more Low Carb Yum recipes! I have the first sweetener you mention in recipe but not the pure monk fruit. Is there a way to adjust recipe? It’s in the recipe notes. Question I don’t have the fruit powder. All I have is splenda or brown sugar splenda. Can I use either one in place of the monk fruit? Plus would it be 1.5 cups sweetener plus say 3 tablespoons more of splenda? Yes. You’ll want to use about 1 2/3 to 1 3/4 cup of sugar equivalent sweetener in the cake. I’m going to try this for my son. His birthday is the 17th of January. I’ll let you know how it went. Sorry the frosting didn’t work out, sometimes it’s a slight difference in ingredients. But, so glad the cake worked out well. I really like that this cake has so much zucchini in it. It comes out moist and has a light feel to it, so that you can pair it with buttercream frosting without it getting too rich. I have made this cake three times. First two times, I made it into a 9×13 pan. Both came out good and moist, but even though I greased the pan generously, the cake stuck to the bottom and sides pretty badly. Oh well, I just spread frosting across the top and called it done. The third time I made this into a layer cake. I carefully lined round cake pans with parchment paper and they came out without a problem. I spread peanut butter frosting between the layers and chocolate frosting on the outside. It was good, but I think I will try using only peanut butter frosting next time. Because this is definitely good enough to make a fourth, fifth, sixth…. time. Thanks for a great recipe! WARNING – this cake will stick to your cake pan like nothing else. I made sure to grease the pans very well, as directed in the recipe, but they still stuck. I broke the first one while trying to remove it and once I had a taste, I ended up scraping all three straight to the bin. It’s best to line at least the bottom of the pan with parchment paper. I use a seasoned stoneware pan and it does not stick. Add 2/3 cup swerve and stir well. Can I use heavy cream uh Ruhr place of the evaporated milk? I had to toss the batter because the salt was overpowering. I’d be willing to try again another day but will not add salt. It’s may also be the baking powder so cut that back in addition to omitting/reducing salt. I just made this cake yesterday. I followed the recipe and the one and half cup of Swerve seemed way too much I had to use almost the whole bag of it I bought. Also it says it doesn’t affect blood sugar but this amount of total carbs just in the Swerve 144 grams. My husband needs to count the total carbs of his intake. So I just don’t know if he can really eat this cake. It tastes really sweet. What if I want to replace Swerve with other no carb sweeteners? Shall I use the same amount? And of course it’s a great cake, thank you! You could cut the bulk sweetener in half and replace some of the sweetener with concentrated stevia or monk fruit. Swerve’s carbs are sugar alcohols. Meaning they don’t get processed the same as regular carbs do. Since there are only 2 categories for carbs, Sugar and Fiber, and swerve is not fiber, it gets listed under “sugar”. But since it is alcohol, it gets burned off, so to speak, and doesn’t actually count as carbs. You’ll notice some nutritional info will now include the “sugar alcohols” at the bottom of their package. Just so you know, Swerve is carb free. If you go to their website, they explain how it is. But yes, I thought the same thing when I first started using swerve, and couldn’t understand why people were using it as a keto dieters answered prayer. I am really geeked about making this cake, but the ingredients do not include coconut flour or the amount to use. Can you provide this information? I would love to make this next week for my son’s birthday. The very first ingredient is 1 cup coconut flour. Do you need weight measurement? It’s in the Notes section of the recipe (at the bottom). I am SO new to this diet – as in one week in. And my birthday is in 2 weeks. My family is not very accommodating, so I’m going to try to make my own cake and hopefully no one complains. I’m confused on ingredients b/c I’ve literally never used them before – If I don’t want to spend the money on monk powder, can I just use a little more of the All-Purporse Stevia sweetener? or is that different from stevia concentrate? Trying to figure out what I NEED to buy, to make it the least expensive. Thank you!! You’ll find the conversion in the recipe notes. You can use the 3/4 Pyure All-Purpose (which is readily available at Walmart) and add an additional tablespoon or two to replace the monk fruit. (note that Pyure is twice as sweet as sugar so you’ll need to use half the amount). It is tough to make the frosting without a powdered sweetener and since Pyure is sweeter than sugar you may need to add in another powder to compensate. I have seen others make a butter and cream cheese frosting will very little powdered sweetener. That small amount of monk powder isn’t going to make a difference. You can leave it out or yes, use your stevia concentrate. Thanks for sharing! I agree. I’ve served the cake to so many people and they always question if it’s really low carb. I like the taste of blended sweeteners better than using a single sweetener. Awesome cake! It turned out perfect! So yummy, light and moist. I’m thrilled with it! Thanks for the review. I really appreciate it. I’m so happy it worked out for you! My wife made this for me yesterday. It had a very pronounced peppery aftertaste. Any ideas why? Hard to tell. It could be from the sweetener, cinnamon, or cocoa. Tried this recipe tonight. Wow! 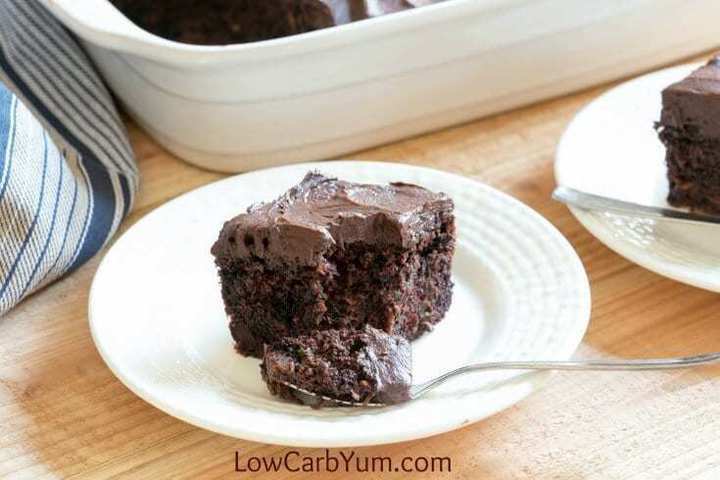 Best tasting low carb chocolate cake ever! I split the recipe in half and it was perfect! Very moist and the taste was fantastic! I used 2 zucchinis (2 cups) and you can’t even tell there was zucchini in the cake! Hi, Lisa, just found your website and made this cake! Everyone loved it! No one could believe it was low carb! I am so excited to try your other recipes! Yay! So glad it was a winner. This looks super yummy! I’ll be sure to try your recipe out soon – thanks! That’s awesome! I used to be the worst cook, but always pretty good at baking. I blame the mixed results on variations in ingredients. Unfortunately, coconut flour can vary more than almond flour. I LOVE this recipe. It freezes so well and the consistency is great!!! I have some in the freezer now individually wrapped in slices. To enjoy, I just let it sit at room temp for 30 minutes to an hour or I’ll toss it in my lunch bag and it’s ready to eat by lunchtime. I made this cake and frosting today and it is so full of chocolate goodness!! My husband said, “it taste like chocolate air, it’s light and fluffy!” I loved it as well! Thank you so much for giving me back my chocolate cake again! The hardest part is not eating it all at once. It was amazing! Glad it turned out light and airy for you. I typically freeze half or only make half a cake. If I don’t hide it out of site, I’ll eat the whole thing! I made this tonight for the second time. Such a good cake!! And the frosting is fabulous!! Thank you!! Thanks so much for letting us know how much you like the cake Lorri! I made this cake with high hopes having just started low carb and wanting to still have a birthday cake. I followed the recipe exactly. Not sure if the ingredients are different here in Australia but it was truly awful! Tasted like cocoa flavoured sawdust. I had to throw it out. Luckily I tasted it before I wasted the icing! Either ingredients aren’t the same, or you didn’t use the correct amount of zucchini/courgette. I’ve made the cake numerous times and it’s always moist and delicious. Some ovens can vary too so it’s good to check on the cake for doneness early as well. I’m in Australia too, and I have also had to thrown mine away…. bitter and nasty!! Maybe we are missing something????? The measurements must be off. I’ve made this so many times and it’s always come out delicious. Maybe the sweetener isn’t at the right amount or too much cocoa? I find some people use baking Soda instead of baking powder. That can leave a bitter taste. 😁 I am Aussie as well! If you measure the zucchini by weighing it according to the recipe, you will get cocoa flavored sawdust. Shred the zucchini on smallest grater and measure in cups. My 4c came to weigh _significantly_ more than the weight listed in the recipe and with the 4c the cake came out moist and yummy. Carbs are for the cake. You can get the information for the frosting on that recipe post which is linked in the cake recipe. I have been using this recipe as the basis for my own modifications (because I can’t help myself). This is an amazing cake, and it has some flexibility too. I’ve made 4 or 5 versions now, always using King Arthur coconut flour for consistency. I’ve varied the sweeteners a bit, preferring Sukrin:1, but also using plain eryrthitol with extra (pure) monk fruit powder (Swanson’s). I didn’t have that much zucchini one time, so I added coconut creamer (per volume replacement) and it worked fine. I actually prefer a little less zucchini unless it’s really fresh. Adding 1 tsp of espresso powder to heighten the chocolate flavor helps, and it compliments the cinnamon. I also prefer this cake – which is amazingly moist and tender – with some chocolate chips. I use Lily’s to stay low carb (and they don’t taste weird). Great job in bringing us a fantastic recipe! Thank you so much for sharing your tips Sara! I always forget about espresso. It really does give a much better chocolate flavor. The recipe asks for cocoa but can I use raw unsweetened cacao? If so, would it still be a whole cup of cacao? That seems like a massive amount as it is pretty strong stuff? You could use 1/2-3/4 the amount and taste test to see if you think more is needed. I haven’t tried it with the raw cacao. I really wish that I would of loved this cake but I just didn’t. I was so excited to make it but it was just so fake tasting. I even made the buttercream frosting but even that was soooooo sweet with an after taste. It may have been the sweeteners you used. They can affect the taste. You’re welcome Barbara! I’m happy to hear it was a success for you! Thanks for all your work! Wonderful taste. Found the outside a little dry. Maybe i cooked it a little long? Could you use an egg substitute, such as flax seed gel in this recipe? Again, thank you for sharing these your hard work! I’m sensitive to egg whites and use psyllium gel which is very similar to flax seed gel. So, yes, subbing the eggs should work. This turned out great! But I crunched the nutrition info based on the weight of zucchini I used, and my total/net carbs are higher than your chart indicates, plus higher calories. Did you not account for the “optional” chocolate chips? And what weight of zucchini do you use? My 4 cups weighed 22.5 oz. Thanks for all you do!!! Anything “optional” is not accounted for. I do not squeeze out the liquid in the zucchini as it helps offset the dry coconut flour. And, I just lightly pack when measuring the cups. I can get a weight measurement added next time I bake the cake which will likely be soon as we are getting a lot of zucchini in our garden right now. Mine was really soupy when i put it in oven 40 minutes later it’s still liquidy in center- I followed recipe to a T- I don’t know what happened. I’m still waiting and checking every ten minutes. Made the frosting- didn’t have confectioners sugar substitute so whipped up some pyrure in my food processor- it’s ok but a little grainy tasting in frosting- next time I’ll buy the confectioners that you mentioned. Can’t wait until it sets so we can try it. It sounds like it could be the coconut flour. What brand did you use? I’m such a skeptic when it comes to most low carb baking, but I made this recipe into cupcakes and they are amazing!! I’m so impressed! I’m hoping to make these for an upcoming party I’m going to and not tell anyone they’re low carb. I’m waiting for my non-low carb boyfriend to come home and try them so I can see if they pass the test, but I’m pretty sure they will! And heck, I’m not sure I really care anymore because I love them! Thank you so much for this recipe! It passed the test with my regular eaters. They kept asking if it was really a low carb cake when I served it at a birthday party. How long do you bake this when making regular sized cupcakes? YUMMY!!!!! Everyone Loved it. Unbelievable! Can’t get enough! You must try! Thanks for writing in and letting us know Katrina! I made this last week and I agree that it’s the best lc chocolate cake. Maybe the best chocolate cake I’ve ever tried! It will be my go-to recipe from here on. The frosting added a decadence to it that made it a real treat. Unfortunately we have learned that my husband is sensitive to coconut oil and flour and so although he loved it, he can’t have it any more. (Darn!) I did freeze part of it and will serve it to my ladies group when we meet here in a couple of weeks. Many of them are having to watch carbs and so I know they will love it also. Sorry to hear that your husband isn’t able to have coconut flour. That is a bummer. I’m not sure what a good sub for it would be. Maybe oat fiber would work, but amount may be different. Have you ever used a combo of regular sugar and sweeteners to improve taste for little ones? What would you think would be a good combo of sugar and sweetener ? I find using a blend of erythritol, stevia, and monk fruit gives a taste most similar to sugar so there’s no need to add in any high carb sweetener. My mom complains if my baked things have no sugar whatsoever, so before I went totally low carb, I was sun a coupe tablespoon of real sugar in, up to 1:4 C depending on the total volume. For this cake, I might go as high as 1/4 C for a non-diabetic picky eater. I am preparing this recipe for my Brother’s birthday and wondered whether you think this recipe is enough for a 3 layer, 9″ round pan cake? Or by how much should I increase and how long do you reccomend each layers to be baked?? Thanks!!! The recipe should make 2 regular size 9-inch rounds. So, you might be able to get 3 thinner rounds. You may want to increase by half the recipe for 3 regular size layers. Baking time should be anywhere from 35-40 minutes so just start to test doneness at about 30 minutes. I’m so glad the guys liked the cake. It’s my absolute favorite low carb cake. I make it all the time and it never disappoints. I am so sorry to report the cake was disgusting, it only tasted of egg to the point of being repulsive. I followed the recipe as is and this has pretty much killed any desire to lchf any longer. Whats worse is that I made a delicious ganache with lots of expensive 70% chocolate. We did not find the cake eggy at all. I served it at a birthday party last summer with a sugar free buttercream frosting and no one could believe it was a low carb cake. Sorry LCHF didn’t work out for you. The longer you are on it, the more you appreciate the recipes. Unfortunately, many people are addicted to sugar and it takes a while to adjust tastes coming off the addiction. It’s fine on the counter for a couple days, otherwise, I’d keep it in the refrigerator. What kind of coconut oil do you use? I use virgin or extra virgin coconut oil. Hi! I would like to make this cake for my diabetic 5 year old. What kind of coconut oil do you suggest? I’ve used various kinds. I like to use virgin or extra-virgin. Could you bake this cake in a Bundt pan? For how long? And do you have a vanilla or marshmallow frosting? This sounds so good! I’m going to make it for Easter. It should fit in a bundt ban. You’ll just need to be careful removing. I recommend using a silicone mold. Excellent cake! Super moist! Everyone enjoyed it! Left out of the monk’s fruit powder but didn’t increase the Swerve as recommended. I thought it was plenty sweet but my grown son said it could have been just a little sweeter. The frosting was really good as well. I did substitute a few tablespoons of the butter with cream cheese. Will definitely make this cake again soon! The sweetener amount in the cake is already reduced a bit from a sugar recipe, but I find I like the cake best less sweet if adding frosting. Unfortunately I am allergic to coconut and almonds. Any suggestion on other ingredients I can use? You could try replacing the coconut flour with a suitable flour that doesn’t bother you like finely ground sunflower seed. However, you’d need more of it and the eggs and liquid would need to be reduced. It’s not an easy substitution. I know this recipe is for a low carb cake, but if I can’t use the sweeteners in the recipe, monk fruit powder and Pyure All-Purpose, approximately how much granulated sugar should I use? You’ll need about 1-3/4 cup sugar for the cake. Some may like closer to 2 cups. Does the nutritional info you have include the frosting? Can you use almond flour instead of coconut flour and butter instead of coconut oil? You’d have to make other changes as coconut flour and almond flour are not one for one subs. Usually, for every cup of almond flour, you’d use 1/4 to 1/3 cup coconut flour plus additional eggs and liquid. Do you have an alternate to the coconut flour and oil? 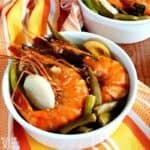 I want to make this but my husband is alergic to coconut? Unfortunately, this recipe was developed to use coconut flour. You might be able to sub with almond flour, but you’d need more flour and less eggs and a bit less liquid. It would need some experimenting to get it right. Can I use stevia in the raw instead of pyure? I already have it in bulk and how much would I use? Also, is there a difference between monk fruit powder and monk fruit in the raw? I don’t know how to shred zucchini but I have a ninja that can purée it. Would that work? Monk fruit powder is concentrated and in the raw is not. You’ll need twice as much stevia in the raw than Pyure. I’m not sure how pureed zucchini would work. I guess that’s worth an experiment. I made this over this cake and frosting on Saturday, after reading all the comments. It is fabulous!!!!! I used the small grate side on my box shredder, had no problems with the batter being dry and it had a beautiful rise. It does have a minty, cool after taste but my hubby and I didn’t mind. The frosting turned out great also, I used the cream cheese advice, no after taste. One question, can I use ZSweet instead of the Swerve? It is easier for me to find and a bit easier on my budget, just wondering. Thank you for sharing this recipe. Any sweetener should be fine in this one. And the bulk sweeteners with added erythritol typically work best in baked goods. It is without frosting. But, you can deduct the erythritol in the frosting so it doesn’t add much. Do you have a vanilla cake version of this? I have one planned, but in the meantime, you can try the poundcake which is the my other favorite cake. I’ve baked them into cupcakes in this recipe and it took 25-30 minutes. I have a question… when measuring out the coconut oil do you measure out 1/2 C then melt or is it 1/2 C melted coconut oil? The amount provided is melted amount, but it should be about the same either way. Where and what brand of cocoa powder do you use? Usually Ghirardelli which has 1g net per tablespoon. I made this over the weekend for my son’s 8th birthday. I had to fudge on a few of the ingredients since I can’t quite reconcile spending so much money on Swerve, so I used a combination of what I had on hand. I added about 1/4c of coffee that was left from the morning. And I didn’t have zucchini, but had yellow squash to use up. It turned out amazing. I also hate the word moist, but this case was MOIST, delicious, and absolutely amazing cold! THANK YOU!!! You’re welcome Delaney. It’s good to know that yellow squash works too! My bf birthday is coming up Saturday I want to make him a chocolate cake he was diagnosed with diabeties and also has to majorly cut his carbs or the dr said he would be dead in 5 yrs. if he knew I was putting a vegetable in his cake he wouldn’t eat it. So my question is can u see the shredded zucchini?? It’s very difficult to detect. If you want to eliminate the green, you can peel it first. I brought it to a birthday party and no one knew there was zucchini in it. I’ve made this several times as cupcakes and they are so flipping good. If you’ve been eating low carb for a while and just need a sweet treat, this is a must! I’ve shared with all my keto friends. Thanks! I love these as cupcakes too! Since this cake was touted the “best” I decided to give it a try. I’m not sure what I did wrong, but it turned out to be probably the worst thing I’ve ever tasted. I don’t think using coconut oil AND flour is a good idea. Neither was adding zucchini. I found another recipe online using almond flour, milk & butter that turned out much better. On a positive not, the chocolate buttercream frosting was amazing. Did it taste too much like coconut or was the texture off? You do want to keep the moisture in the zucchini and not drain it. Why would be so salty? Did you subtract the erythritol? It has almost no impact on blood sugar. I was a little concerned when the cake didn’t “rise” in the oven. No matter how long I baked it the bottom was still gooey, so I decided to take a chance and cool it and my oh my did that make a difference!It was still better with my low carb chocolate ganache of sorts ( I made this with 4 bars of ghirardelli 100% cacao, about 1/4 cup whole milk, 1-2 tbsp almond butter and some swerve and splenda-micrwaved to melt the chocolate till the milk bubbles and just stirred it all together). Refrigerating the whole thing with the chocolate ganache made a big difference and the cake was a hit with my to be in laws!Thanks so much for the healthy recipe! Most low carb baked goods need to cool completely before you can tell. Love this recipe! Made it for my family for Christmas, and they all loved it. I was wondering, could I use this to make a zucchini bread? I would omit the cocoa powder, and bake in a bread pan. What would you suggest for cooking time? 50 min or so? Also, should there be any other modifications you suggest? Thanks so much! You may need another ingredient in place of the cocoa for bulk. I’m thinking low carb unflavored whey protein powder may work. I am baking this cake right now. Is the batter supposed to be so thick you can barely stir it? I’m nervous it’s too thick…had to spread it in pan like it was almost clay. Thanks. I double checked all ingredients over and over. The batter is thick, but not like clay. The moisture comes from the zucchini. Was your shredded zucchini wet? I squeezed out the zucchini. I think next time I will leave it undrained…the cake was a bit dry. Thanks a bunch. Lisa – Thank you for this and all of your awesome recipes. 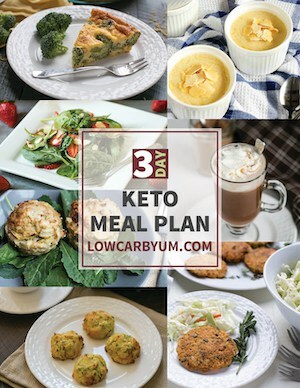 I have never been a cook in my life but with the change to low carb six months ago I discovered your site and have found your recipes so easy to follow I feel like I am now a great cook! Thank you for making this way of eating a breeze to stick to. -50# YAY!! You’re welcome Charlotte! I was never much of a cook before going low carb. This way of life forced me to learn! Thank you so much for this! I made this a few days ago and it’s already nearly gone. I love chocolate and knowing that i can still have amazing cakes like this on a LCHF diet makes life so much better! I know that i am not poisoning my body when eating this, if anything, i’m nourishing it! You can’t even tell that there is zucchini in it. I didn’t strain the zucchini, so it was lovely and moist. I added the sugar free chocolate bar too, and it was HEAVEN! I was looking for a cake i can make for Christmas that no one will be able to tell its sugar free, and this is winner. Thank you so much, it’s amazing!! Thanks for writing in Michelle and letting us all know how the recipe worked out for you. This one is my favorite low carb cake of all. Best cake EVER!!! I have made this many times, and everybody loves it!!!! I have erithritol and powderd stevia but none of the sweetener blends you suggest. Can you let me know if either of those will work or if I need to do some kind of combo (half and half maybe)? I do have the monk fruit for that part. You’ll need about 1 3/4 cups to 2 cups sugar equivalent. You could use about 1 cup erythritol and 3/4 teaspoons stevia powder (about 1 1/2 tsp liquid stevia). Hi, this sounds amazing and I miss cake so much but I only have stevia, I don´t have Pyure all purpose, I live in Mexico and it is really hard to get it, how much stevia should I use? You need about 1 1/2 teaspoons of a concentrated stevia powder. What is your favorite cocoa powder to use? I have Sprouts brand. Thank you! Love your recipe s! I’ve used various brands with good results. I do like Ghiradelli, but Hershey’s Dark has always been a favorite too. Everything low carb uses coconut 😝, I know substituting almond flour for at least 1/2 the coconut flour will require less liquid, but can I use butter instead of coconut oil? You should be able to use butter instead of coconut oil. They are similar when used in baked goods. I am sorry to say but this wasn’t very good. We followed the recipe perfectly but it tasted bad. There was a very artificial after taste. If there is any idea what went wrong reply. What did you use as a sweetener? The brand of cocoa can also have an impact on flavor. This cake was awful. It looked like someone took a big dump and tastes like it too. Don’t do it!! You must have made it incorrectly. I’ve made the cake more than 10 times without an issue. I even passed it off as a regular cake. I made this cake as cupcakes this weekend and put a little whipped cream on them (both reg and chocolate whipped cream) right before serving. Wow, they were awesome! But for next time can I use vegetable oil instead of coconut oil? Too many saturated fats in the coconut oil. Had to give my sister the recipe-she loved it! I don’t recommend vegetable oil as coconut is much healthier, but you certainly could use it if you wish. Here are some of the benefits of coconut oil. How many vegetables do you know that have mass amounts of fat? Olive oil is about the only one; but it isn’t ideal for baking due to flavor. Despite current food pyramid guidelines, saturated fat (and all fat), when combined with a low-carb diet, is not unhealthy. Saturated fats are, in fact, good for you. Vegetable oils are all unhealthy, as they are chemically produced. Hello, I tried the cake and its very good. I’m just not sure if I got the right measure. How large is a cup? I find 340 g in internet but this seems a lot, so I used 150 g but I think it was still too dry. But it is stil very good. What ingredient are you referring to? Coconut flour, zucchini? The zucchini measurement isn’t as important as the coconut flour. One medium size zucchini is about 2 cups shredded. I put 150 g of coconut flour and two zucchini. It was a bit dense by my opinion. But everybody liked it, and no one could ever tell that there’s zucchini inside. I had high hopes after reading the comments. Purchased, made exactly as listed and had it tonight for a desert for a dinner party. Everyone agreed it was very bland, awlful tasting cake. Good texture but flavorless, even with the exactly made link of frosting receipe. An epic fail and waste of money. It did not taste like chocolate cake? What kind of cocoa did you use? The BEST!! Made it one weekend when my girls visited; nobody could tell the difference. I do think it’s tough to tell with this cake. My family didn’t believe me when I told them it was low carb. I’ve tried so many low carb cakes and this is BY FAR the best. Thank you!! Next time I make it I was thinking of substituting the tsp of cinnamon with some coffee (because I assume the cinnamon is only there to enhance the chocolate flavor?? is that true?) and then topping with a mocha frosting. Do you think that might work? It’s very similar to a regular cake so it shouldn’t be a problem with cutting. It cuts in pieces well after frosted. It’s a big cake. You could try reducing to 3/4 cup, but I wouldn’t go lower than that. The original recipe was a 9×9 and used 1/2 cup. Can we have the measurements in oz or grams, I can’t tell how much flour to use. When I make this again, I can weigh. I probably should do that for all recipes. Weights are much more accurate. There are conversions available online if you search for them. yes , please do the receipe in grams , thank you. Sorry. It’s tough to change old habits. Can I coconut sugar instead of the Stevia powders? If so, how much? You can, but it adds a lot more carbs. I also wanted to use Coconut Sugar instead of Stevia and Monk Fruit. How much do I use? You’ll need about 1 2/3 cups or adjust to taste. I typically keep things on the less sweet side. I would love to make this but just can’t get myself to spend almost $30 for the monk fruit. Any replacements for monk fruit? Did you miss the recipe note at the bottom? It tells you how to replace the monk fruit extract. Swerve is a one-for-one sugar replacement. You can sub it with any equivalent sweetener like Splenda. I usually take it out and serve room temperature. But, if you don’t want to do that, it should keep for a few days at room temp. A cake that looks that scrumptious wouldn’t last a few days in my house. That’s exactly why I have to hide it out of sight! Why is this cake so high in sodium? Is it necessary……not the best for most folks over 40……great for the young ones! It’s not that high. All the sodium comes from the baking powder and soda. Those are needed to give a rise and comes from sodium bicarbonate. Can I use sodium-free baking powder and baking soda? I just made this cake and it smells so good in the oven! I did have a comment- I put these ingredients in my FitnessPal app and it came out to 17 carbs and 2.4 g of fiber (net carbs 14.6). I checked the ingredients list and the coconut flour and the unsweetened cocoa are the largest carb contributors. 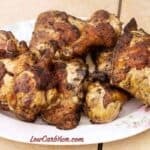 Should I have used a specific type of coconut flour and cocoa powder to lower the carb count? I find coconut nutritional info varies a lot. It depends on the product chosen. I calculated with Calorie Count. Made this today and it was awesome!! Absolutely love the frosting also. Thanks for sharing . Is it best to keep in refrigerator ? I find it best to store in the fridge. Hi, can I clarify – are there two types of sweeteners in this? Sukrin / Pyure / Swerve and then monk fruit or the monk fruit substitute? For the whole recipe, it would be better to use at least 1/2 to 1 teaspoon stevia. You could taste the batter and adjust to taste. With the amounts listed, it’s not a very sweet cake. What type of stevia powder are you referring to? I use Sweetleaf, but buy the type with no filler in it whatsoever. So, for example, 1/16th of a teaspoon makes a sweet cup of coffee…as if you used two splenda packets. Which kind are you referring to? The Sweetleaf in the grocery store has filler. Thanks for the clarification. It’s the concentrated stevia with no fillers. I use Now Foods Better Stevia. Can an all purpose gluten free flour mix be use in place of the coconut flour? If so, what, if anything, needs to be reduced? You’d likely need more of the flour mix, less eggs, and less zucchini. Has anyone come up with measurements if almond flour is used instead of coconut? Thanks! There would be other adjustments needed to use all almond flour. I’d think you’d need alot more almond flour as well. I made this cake last week with buttercream frosting and it was a huge hit. The cake is really fantastic! The only problem I had, was, that I obviously do not tolerate coconut flour. I was the only one, my kids and my partner didn’t have any issues. So, my questions is, can I substitute almond flour or almond meal,, for the coconut flour and if so, I would have to reduce the eggs, or not? Or how should I otherwise adjust the recipe? You’ll want to reduce the eggs and possibly add more almond flour. Also, the liquid which comes from the zucchini may need to be reduced when using almond flour. It’s hard to say without experimenting with the recipe. I’ll play around with the ingredients and let You know, how it turned out! Mother of all things Yum! Yes! This does deserve the name you have given it. I have made many low-carb cakes in my day, but I do believe this is the best. Thank you! I loved it. My husband loved it. People who don’t do low-carb or sugar substitutes had no idea. Perfect recipe for a moist low-carb chocolate cake. So glad it was a hit for you! I’ve served this one to those who don’t do low carb as well and they could not tell it wasn’t the real thing. Thanks for a great recipe. I made it yesterday and posted it on my blog. With credit to you, of course. Thanks for sharing. Love that you topped it with Sukrin Melis! You´re welcome. By the way – is the 4 cups of zucchini before or after it´s drained? Can I use zucchini puree instead of shredded zucchini or would I have to decrease some of the oil to use this substitution? It may be too watery, but worth a try. This is so delicious, made it today and iced with chocolate cream cheese icing…all low carb. I added a teaspoon of instant coffee into the batter…so moist. Thankyou for a great recipe. A bit of coffee does enhance the chocolate flavor. Will have to try next time! 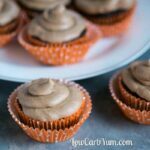 And, the chocolate cream cheese frosting sounds super yummy! Where can I find Monk Fruit powder? I buy mine off Amazon. Here’s a link. Hi. What do these ingredients do? And how can I substitute. I don’t recognise the names. Are they available in Australia? 3/4 cup Sukrin+ or Pyure All-Purpose (or 1 1/2 cup Swerve). These are sweeteners. You can replace with 1.5 cups of sugar equivalent sweetener. 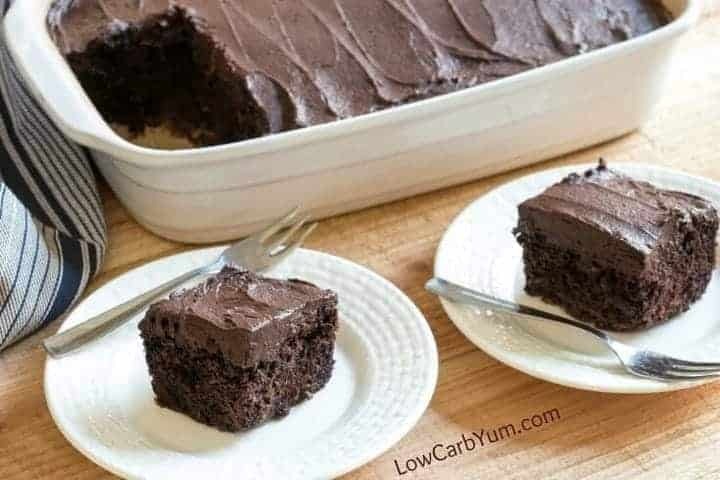 I’m totally making this because I’ turning 50 this week and dang it, I want cake but I am not willing to get out of ketosis! It is a real cake and will make you feel like you’re cheating! Does it make much difference if peeled zucchini is used? I wouldn’t think so. It’s just easier to leave it on. And, there are nutrients in the peel. Could I use melted butter instead of the coconut oil? Butter or another fat/oil should be fine to use. What does the Monk fruit powder do? is there a substitute? It’s a concentrated sweetener. You can add another 2 to 4 tablespoons sugar equivalent of any other low carb sweetener to taste. I like monk fruit because it has zero carbs and no aftertaste. I want to try this cake, but I’m not sure what you mean by 2 to 4 tablespoons sugar equivalent of any other low carb sweetener. Does this mean a low carb sweetener that = 2 to 4 tablespoons sugar? So I could use 1 to 2 tablespoons of pyure all purpose sweetener which you use at a 1:2 ratio? That is exactly what it means. Low carb sweetener that is equivalent to sugar. I’m working on my own low carb sweetener blend so that might make it clearer.